For the salsa, combine all ingredients and toss well. Let sit for 10–15 minutes to marinate while preparing the seasoning and cooking the meat. For the beef tenderloin seasoning, combine all ingredients. Lightly oil the tenderloin and spread an even layer of the dry seasoning over the entire roast. Place the seasoned roast on a roasting or broiling pan and roast 10–15 minutes (to a minimum internal temperature of 145 °F). Let cool for 5 minutes before carving into 16 slices (1 ounce each). 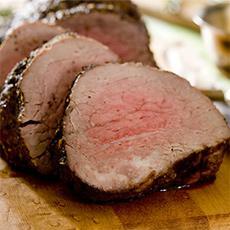 Serve four slices of the tenderloin with 1/4 cup salsa on the side. Tip: Delicious with a side of rice and Grilled Romaine Lettuce With Caesar Dressing.